Can the color of the dark gums be changed to pink? There are people who have really dark gums and are extremely shy of showing their gums, smile or laugh. The reasons for dark gums can be genetic especially people with darker tones, due to smoking, intake of certain medicines, metal based crowns and restorations or even poor dental hygiene. Excess melanin builds up on the gums and make it brown or even black called hyperpigmentation. It could be the whole gum or some portions of the gums. 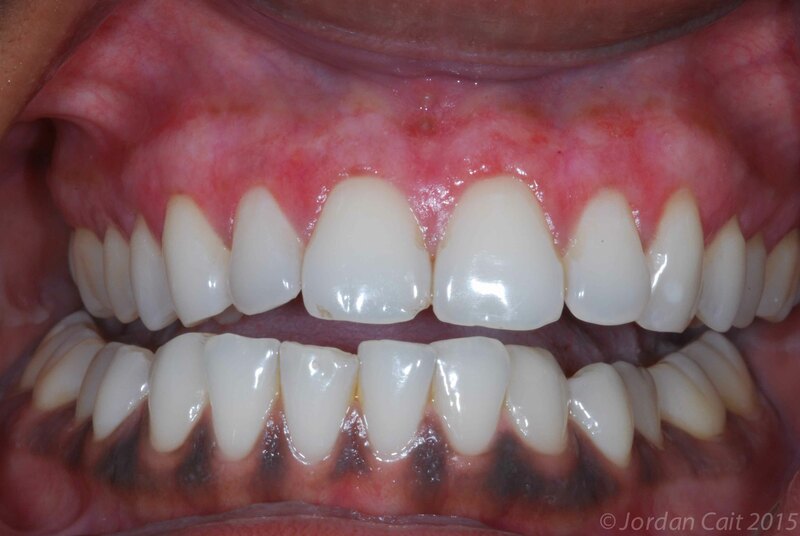 Regardless, there are procedures that can make your gums pink and beautiful through gums bleaching. How much time does Gum Bleaching take ? The whole gum bleaching procedure takes one visit only and the patient comes out with pink, healthy gums and a confident smile. After the laser treatment, patients may have a minor discomfort but they can speak and eat normally immediately after the treatment is completed. Most gum bleaching treatments can last for your entire lifetime. Your results will depend on the type of the treatment used by your dentist. Who can take this treatment? For gum bleaching procedures your gums must be healthy. We can assess your gum health at the consultation that you have with our dentist. Taking blood thinners. The treatment can cause excessive bleeding during the procedure. These conditions need to screened prior to performing the gum bleaching procedure. Healthy gums respond better with reduced irritation compared to those infected. Reduce your gummy smile and regain confidenceWhy you shouldn’t ignore missing teeth! Where is gum bleaching available in Melbourne? I can not find anywhere that provides this service. We would shortly revert to you via your email.